In a study published in Angewandte Chemie, MARVEL members report on the increased stability of tin nitride under compression. Mechanism for electronic bang-up opening. Highly stable materials are usually wide-gap insulators, on which covalency dominates the ionic exchange, such as in carbon (diamond). In this work, MARVEL members Miglė Graužinytė and José. A. Flores‐Livas (University of Basel) together with an international collaboration of experimental groups in USA and UK studied the origin of the enhanced stability of Sn3N4 to applied pressure and temperature. The unique stability of the spinel (Sn3N4) phase is attributed to its dominant ionic character. The experimental team could confirm the predicted phase transitions predicted in University of Basel by state-of-the-art Synchrotron X-ray diffraction and EXAFS measurements on different annealing procedures. This work is now published in Angewandte Chemie (Int. Ed.). The work demonstrates that the application of pressure allows a systematic tuning of the charge density, cleanly, that is, without changes to the chemical composition via dopants. 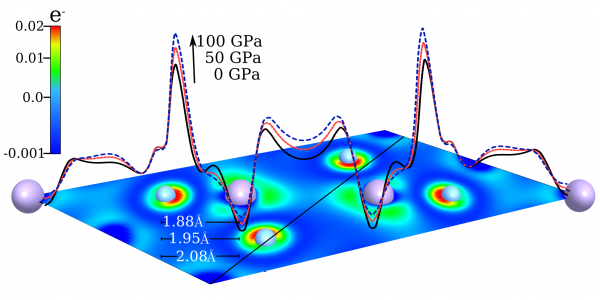 More importantly, the theoretical team in Basel revealed the mechanism responsible for the opening of the electronic band upon compression for which a continuous opening of the optical band gap is observed from 1.3 eV to 3.0 eV over a range of 100 GPa: a 540 nm blue‐shift spanning the entire visible spectrum. The pressure‐mediated band gap opening is general to this material across the numerous high‐density polymorphs, implicating the predominant ionic bonding in the material as the cause. The rate of decompression to ambient conditions permits access to recoverable metastable states with varying band gaps energies, opening the possibility of pressure‐tuneable electronic properties for futuristic applications. J. S. C. Kearney, M. Graužinytė, D. Smith, D. Sneed, C. Childs, J. Hinton, C. Park, J. S. Smith, E. Kim, S. D. S. Fitch, A. L. Hector, C. J. Pickard, J. A. Flores‐Livas, A. Salamat, Pressure‐Tuneable Visible‐Range Band Gap in the Ionic Spinel Tin Nitride, Angew. Chem. Int. Ed. 57, 11623–11628 (2018).